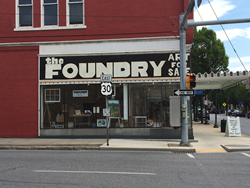 Art co-op, The Foundry, located in downtown Chambersburg is set to have their grand opening July 1. Artists of all ages are encouraged to become a part of The Foundry’s members. This summer will lead to a major event for The Foundry in downtown Chambersburg: the co-op is set to have their official grand opening on Friday, July 1. Walking into The Foundry, a person can immediately feel the artistic atmosphere. Wall-to-wall art is displayed, along with set-ups in between displaying jewelry, handbags, pottery, paintings, photography, and much more. There is something for everyone to enjoy in even the more obscure art forms. The Foundry has technically been open since last October, starting with having the shop open on weekends, and then this past January, they upgraded to regular hours Thursday through Saturday. However, the establishment never officially had its grand opening, so the celebration on July 1 will celebrate that. A ribbon cutting ceremony, entertainment from a band, craft exercises for attendees, and different artists representing their trade are just a few things planned for the day’s festivities. Depending on their craft, artists may be painting, hammering, woodworking, or using another craft method to show how they create their artwork in real time. Attendees will be able to witness the artist truly at work, and at 8pm that night, people can bid on those crafted items at an auction that will be held. Artists of all ages are encouraged to become a part of The Foundry’s members or submit artwork to the establishment. Currently, there are 28 official members of The Foundry, all local artists, some of whom can be found currently working in the co-op and have art on sale. The Foundry also accepts volunteers to work at the co-op, and also offers annual classes for different ages if interested in learning to develop your own skill. For more information on The Foundry, check out their website at http://foundryartscoop.com/. The co-op’s current hours are 12-8pm Thurs-Fri, and 10am-6pm on Sat.